Picked this up over the weekend. Was very surprised with this find. Great find! There might not be that many out in the wild. was it just a 'rare find' or was it also a bargain? I like it best when it's both. those seem to not be as rare as the griswolds... but still not a very common find at all...Ive seen a couple at cast iron auctions... but never one out in the wild. 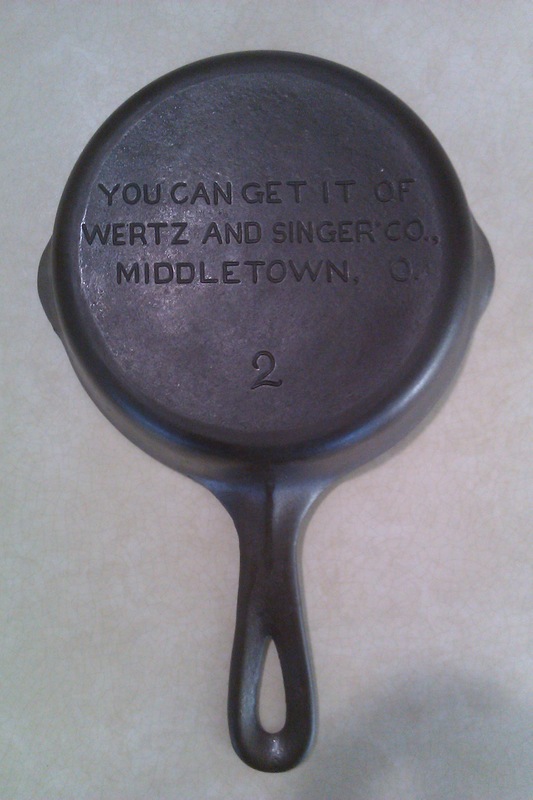 It was sitting on a table with a Griswold #6 slant logo skillet. Paid $25 for both. Gave her the money and was very very happy guy. I found mine in the wild - flea market near Chattanooga TN long ago. The only thing that came to mind after cleaning it was that it had been "shoe-blacked," as the chrome wasn't visible. That's what I enjoy about collecting cast iron. There are so many different things out there to find and then posting here and finding out that there is also a chrome #2 and an #2 with advertising. I will keep looking and thanks to everyone who posted. are you still looking over your shoulder waiting for the police? 'cause you stole both of those. It was very hard not run after I gave her the money. That was a super deal! Way to score not one but two nice pans.